A Vietnamese silk blouse made with something of a 70’s vibe, although it was easier to sew than some of the stuff that I made in the 70s. 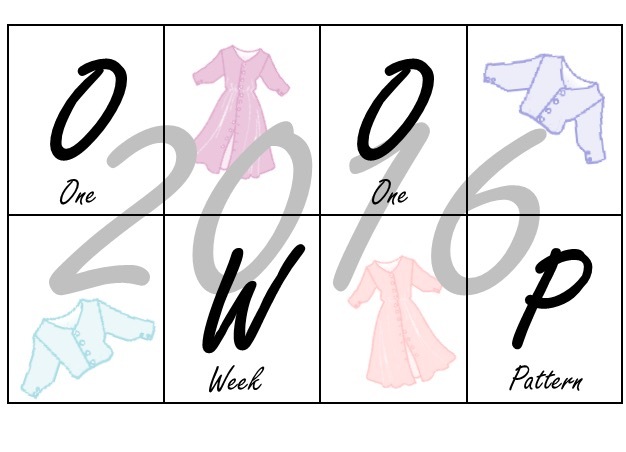 This has been almost that long in the making; I bought the fabric last November. I bought two matching lengths of silk on Hoi An market with a view to perhaps making a matching top and trousers. This happened whilst everyone else was visiting tailors and getting things made. I thought ‘ I don’t need a tailor; I can make things myself’. I brought it home and went back to making the silk scarves for Christmas presents and having loads of trouble with my overlocker (now sorted, as you will read later….) Hence I called this picture, why am I cutting out silk again? As you can see, I used my board and rotary cutter again, weighed down with kitchen weights. You may also be able to tell that the fabric turned out to be quite narrow. Too narrow for a top and trousers, but amazingly, pretty much the right amount for this blouse pattern, which I had had in stock for a year or so, and never used. A pretty good fit for the sleeves, don’t you think? I cut it out before Christmas, and for whatever reason, the pieces sat in my dining room, a bit unloved, for several weeks. 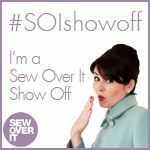 To be honest, I was a bit scared, especially as I knew that the best way to finish off the flounces was by using the overlocker to roll a narrow hem, and you may have seen what happened last time I did that. Anyway, with the prospect of work getting closer, it reached the top of my ‘to sew’ list and I started sewing. In the past I would have used French seams everywhere, but they are tricky with Princess seams, so I finished every exposed seam on the overlocker first. No problems. Its just rolled hemming that has a problem. The yoke and front sections are faced, so only the side seams, arm holes and join between the flounces are exposed. I did not finish the front centre seams are there are lots of pleats there, meaning quite a thickness of fabric, even with silk. 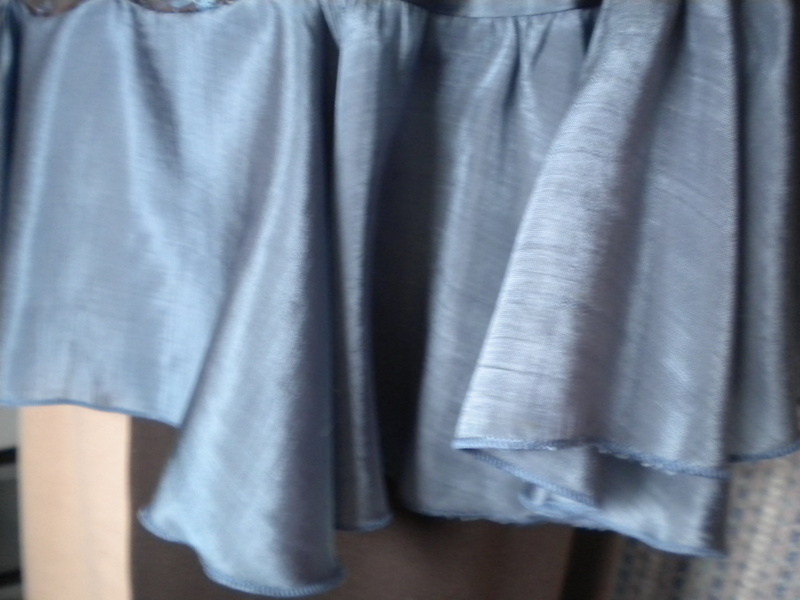 In fact, getting those pleats right is quite tricky, and probably harder with silk. Firstly, I tacked the front to its facing, down the centre seam. You’ve lost all of your pattern markings to the inside by this stage, but I measured the pleats in the pattern and then on the fabric and found that they folded into place quite naturally. 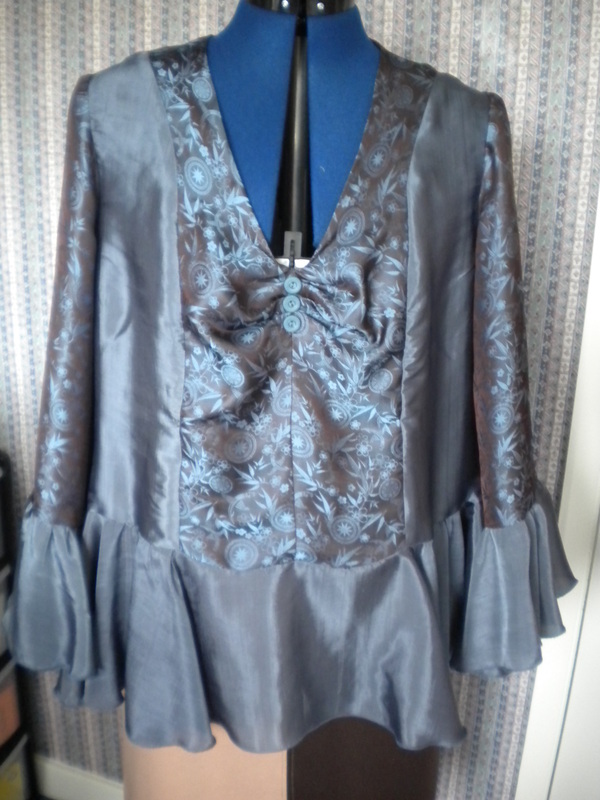 In fact, you don’t get a proper feel for the fit of the blouse until the pleats are completed. 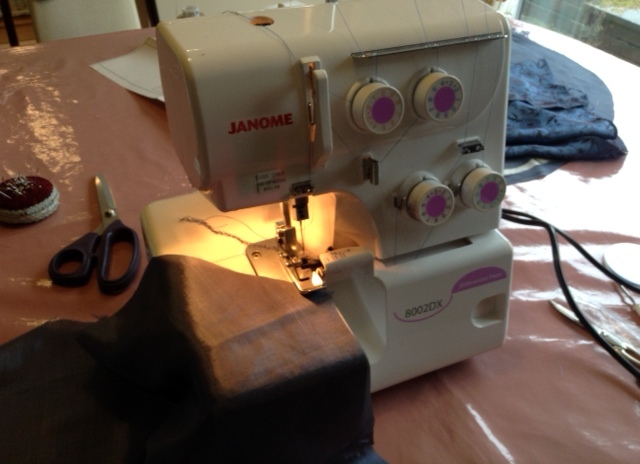 Then, with some degree of vigour, I tacked the pleats in place before stitching by machine down the centre front. I did not want anything to slip! 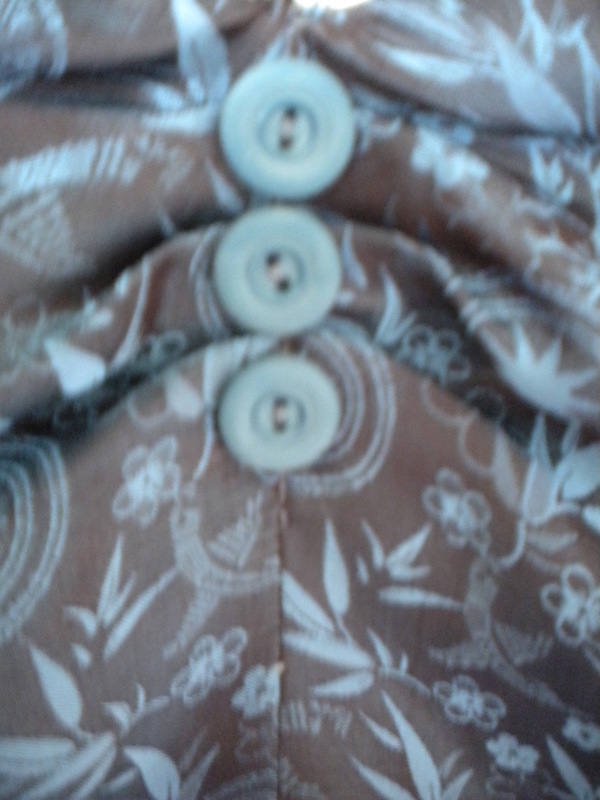 I had found two decorative button options, and plumped for the single shade buttons after careful consideration. Source: Birmingham market, of course! 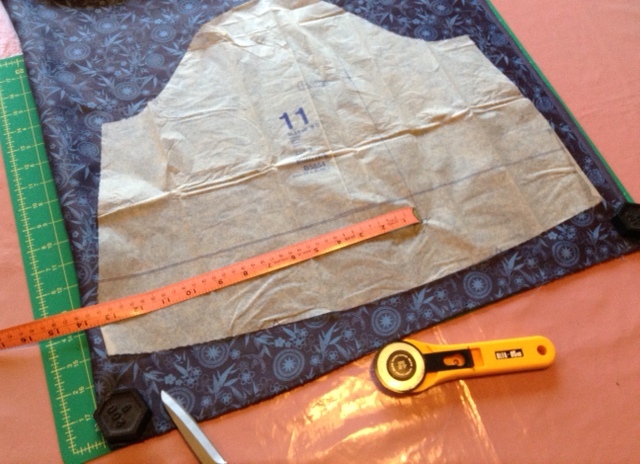 And then to the flounces….. two for the sleeves and one for the bottom of the bodice. Ready to roll (except this is a test scrap of fabric)…. And the thread snapped about 20 cm in! Try again. Fail again. Get the manual out. Confirm it is threaded and set properly. Of course it is; I have done this enough times to know now. So some new thinking is required here. Tweet Jamone. Phone Frank Nutt in Kings Heath. Initially I wasn’t too keen on dragging the overlocker back to Kings Heath, as I knew that they would test and it would all need re-threading yet again. But I have a carry bag, and a car, Kings Heath isn’t far, they are willing to help and I need to get this fixed. So off we all went. Well, the trip was so worth it. Yes, the thread snapped again. The lady thought she knew the problem. All threads need to be under the foot to start. I learnt that one in the early days! It snapped again. Some of you may know what’s coming……. Luckily the engineer was on site so we called him over. I already had my suspicions. If the machine was set and threaded correctly, then it had to be something else. I suspected the thread, and I was right. The engineer tested a few things; I found myself nodding. He reached over, looked at the thread and diagnosed the problem. 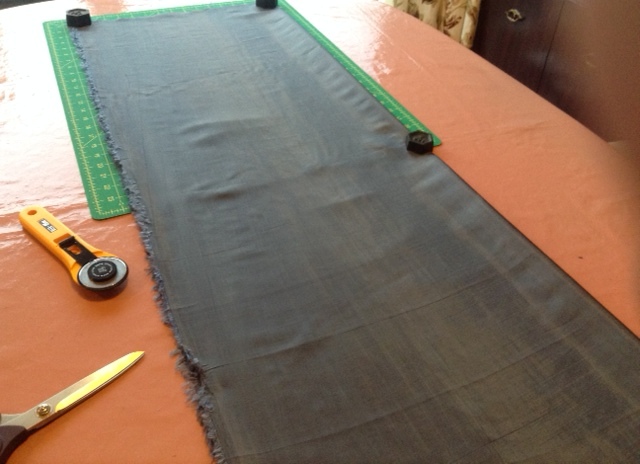 So he threaded it (in no time) with better quality thread, and off it went – whizz….. over a metre of rolled hem and no broken thread. Wonderful. So I purchased 3 reals of the correct colour thread, came home and within 20 minutes I had all the rolled hems that I needed. So many thanks to Frank Nutt’s team (I did thank them via their website), and also to Jamone, who responded to my tweet, but of course it was fixed shortly after I had contacted them. I have seen various blogs about limiting the colours that you use for overlocking, and indeed, I apply most of the principle myself, but you do have to use the right colours for rolled hems. The upper looper ran out exactly at the point where I had finished. This was meant to happen. Note to self (and I do refer to my blog for details of lessons learnt from time to time) and useful information for anyone else who is similarly suffering: thread quality is numbered. The higher the number, the better the quality. The engineer estimated that I was using 40. He tells me that ordinary Gutermanns thread, which I bought, is 60, which actually, still isn’t really ‘good’ enough for the overlocker. The manual states 80 – 100. I bought cones of 120, labelled as overlocker thread at the NEC last week. Just fawn and black, of course. (They didn’t have enough white.) Thanks to the lady next to me who commented that she too had learnt the hard way, and that it was well worth investing in good thread. So why was the thread only breaking when I was rolling hems? And why was it only the lower looper? Well, to roll a hem, you tighten the tension on the lower looper up to 7. The poor quality thread was getting stuck in the tighter tension control, and snapping when it got stuck, which it was pretty much doing at the same point every time that I started to use the function. Basically I have been getting away with poor thread for ‘ordinary’ overlocking, when all tensions are set to 3. With this knowledge, I will cautiously use up my poor quality thread for basic overlocking, and will replace with good quality in good time. A word of warning though. I notice that not all thread has these numbers displayed, and the engineer did advise that some thread labelled as overlocker thread may still not be of suitable quality. There was just about enough fabric for the pattern, so maybe this was meant to be my present from Vietnam. It fits well round the bust, but is a bit big lower down. It is indeed, very loose fitting. The sleeves are enormous; very 70’s. I will not be able to get any coat over it, and I will not be able to eat wearing it, as the sleeves will drag into the food. I vaguely remember this problem 40 years ago. So its for a summer evening, where no food is involved, possibly with a poncho / wrap that I don’t yet own!! I vaguely wonder about taking in the seams, but then it may not hang properly, especially the flounces, so I wont risk it. 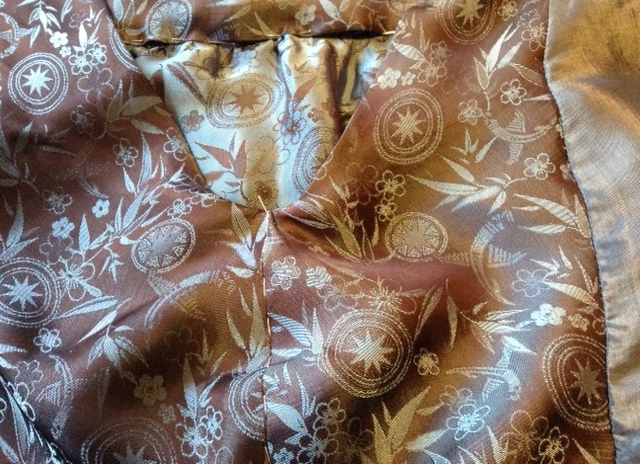 It is unique; its rather nice to look at, and above all, I have fixed my overlocker problem during the process of making it. So that’s button holes and rolled hems both working properly now! Now where is a pattern for some sort of wrap that I can make in a similar shade? 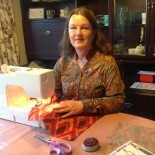 This entry was posted on March 26, 2015 by ann hebden in Blouses, Butterick, Fashion, Sewing, Silk, Tops and tagged blouses, Butterick, Fashion, Handmade, Overlocker, Rolled hem, Sewing, Silk, Tops.